National American Indian Heritage Month is celebrated throughout the month of November and acknowledges the many tribes throughout the country. Native Americans have made a significant and diverse impact on Western society, and this month of reflection is an opportunity to expand your knowledge and appreciation of Native history, heritage and education. 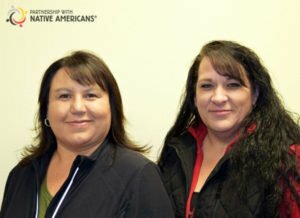 Partnership With Native Americans (PWNA) is proud to work with more than 300 Native American communities annually to support positive futures for Native Americans living on remote and often impoverished reservations. As part of its recognition of Heritage Month, PWNA is awarding five additional laptops to Native students who are pursuing their freshman year in post-secondary education and receiving 2017-18 scholarships through its American Indian Education Fund program. “Only 13% of Native American students hold a college degree. By assisting Native students through our laptop giveaway – and our scholarship program – we hope to give more American Indians and Alaskan Natives the resources and encouragement they need to complete college and succeed as future leaders,” says Robbi Rice Dietrich, President/CEO of PWNA. At Salish Kootenai College (SKC) in northwestern Montana, out of the 800 to 1000 students enrolled, only 10-15% have laptops. “A lot of the students can’t stay on campus in the evening because of transportation, or they can’t come back to campus to study because they have families. They don’t have computers at home or even Internet service,” said Jackie Swain, Director of Financial Aid. Her colleague Ellie McLeod, Director of Scholarship Acquisition and Distribution, spoke to the importance of financial aid in securing education for Native students. “I don’t know what our students would do without funding… Scholarships are critical for the success of our Native students,” she said. PWNA also works to more accurately inform the public about life on the reservations, and invites you to grow your knowledge of Native history, education, and heritage by participating in its Native education quiz and random daily drawings this month. With 567 federally recognized Indian tribes, reservations and pueblos in more than 30 states and nearly 35 state-recognized tribes, Native American history and culture is as diverse as it is expansive. 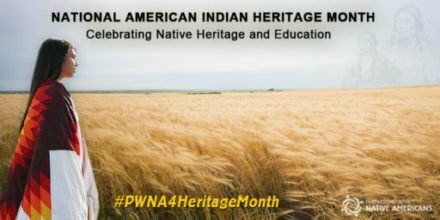 To learn more about Native history and heritage, and join PWNA for Heritage Month education and giveaways, visit www.PWNA4hope.org. This entry was posted in Humanitarian and tagged AIEF, college, education, Heritage Month, Native culture, scholarships. Bookmark the permalink. Trackbacks are closed, but you can post a comment. Its a great post. Thank you for sharing. I will discuss this article with teachers and students at www.qanda.typicalstudent.org.